These are hand crafted imitation (this product is not indian made) stone indian arrowheads. 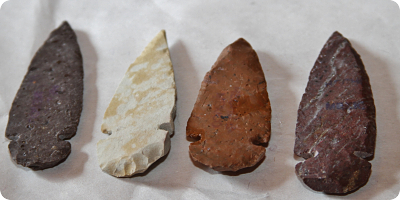 The arrowheads vary in sizes from 3/4" to 2". They also vary in colors. The arrowheads are sold in batches of 10 or 100 pieces. This is a hand crafted imitation (this product is not indian made) native american indian breast plate. 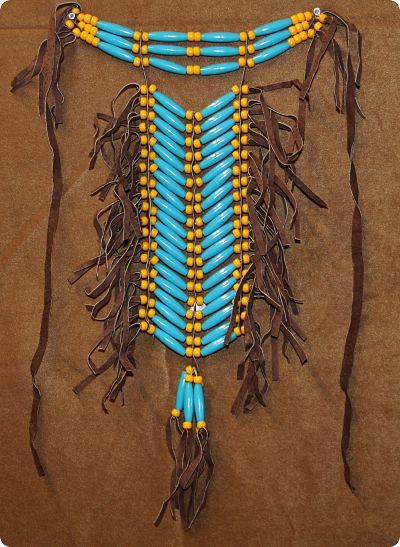 The breast plate is 18" by 19" in length and is made out of plastic beads, brown leather strips, a beaded band and three beaded rosettes. The breast plate is adorned with black hackle feathers. This indian breast plate is perfect for costumes, parades, boy scouts or collectors. Note: Beadwork designs may vary from those shown. This is a hand crafted imitation (this product is not indian made) native american indian breast plate. 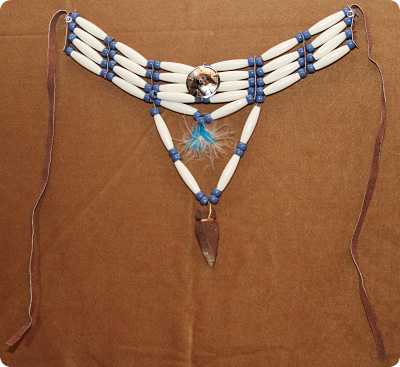 The breast plate is 13" by 18" in length and is made out of plastic beads and brown leather strips. This is a hand crafted imitation (this product is not indian made) native american indian breast plate. 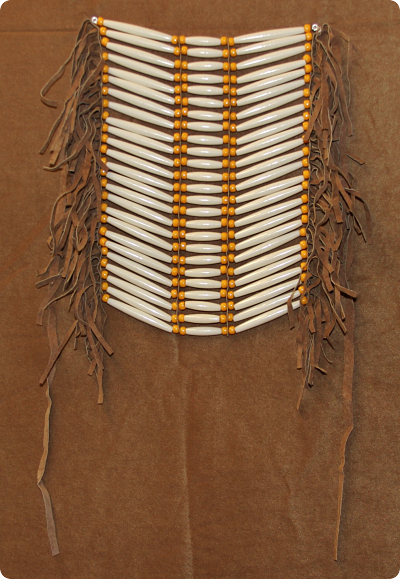 The breast plate is 22" by 18" in length and is made out of plastic beads and brown leather strips. 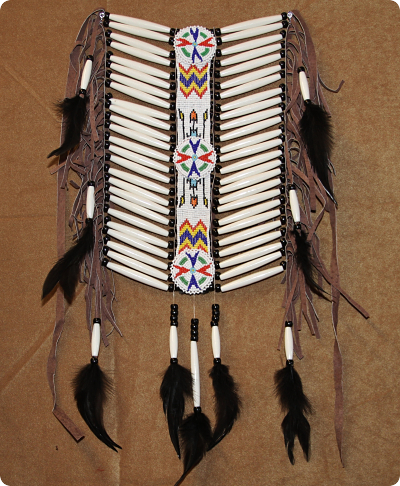 This is a hand crafted imitation (this product is not indian made) native american indian breast plate. 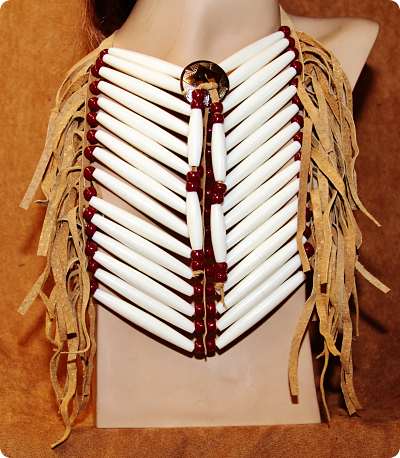 The breast plate is 16" by 13" in length and is made out of plastic beads and brown leather strips. This is a hand crafted imitation (this product is not indian made) native american indian choker. 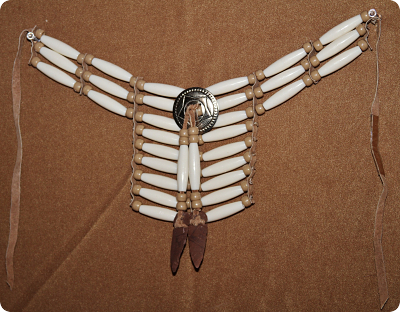 The choker is 13" by 6" in length and is made out of plastic beads, brown leather strips and one indian arrowhead. 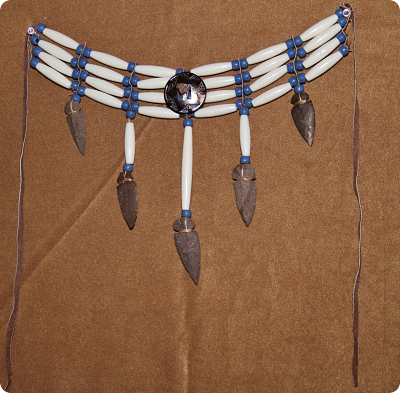 This indian choker is perfect for costumes, parades, boy scouts or collectors. This is a hand crafted imitation (this product is not indian made) native american indian choker. 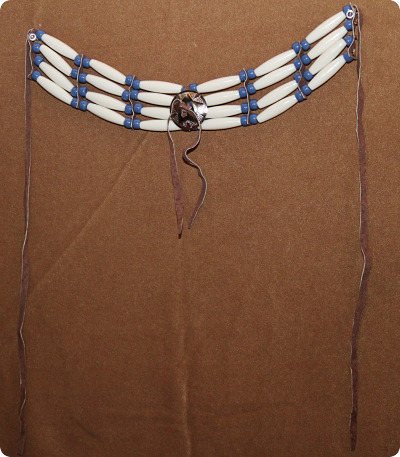 The choker is 13" by 7" in length and is made out of plastic beads, brown leather strips and five indian arrowhead. This is a hand crafted imitation (this product is not indian made) native american indian choker. 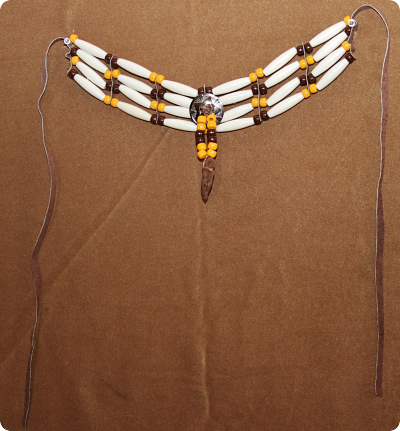 The choker is 13" by 8" in length and is made out of plastic beads, brown leather strips and one indian arrowhead. This is a hand crafted imitation (this product is not indian made) native american indian choker. 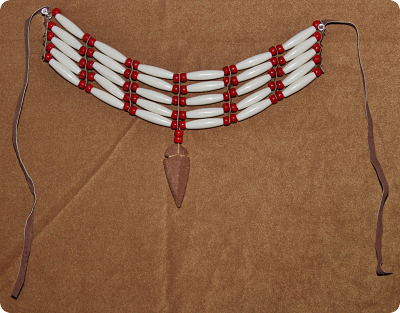 The choker is 13" by 4" in length and is made out of plastic beads, brown leather strips and one indian arrowhead. This is a hand crafted imitation (this product is not indian made) native american indian choker. The choker is 13" by 6" in length and is made out of plastic beads and brown leather strips. This is a hand crafted imitation (this product is not indian made) native american indian knife and pouch. The knife tip is made out of hand crafted obsidian and is approximately 5 1/2" to 7 1/2" long. The handle is made out of cardencha and is connected to the tip with leather strips. The handle is approximately 6 1/2" to 8 1/2" long. The knife comes with a hand made leather pouch for travel. 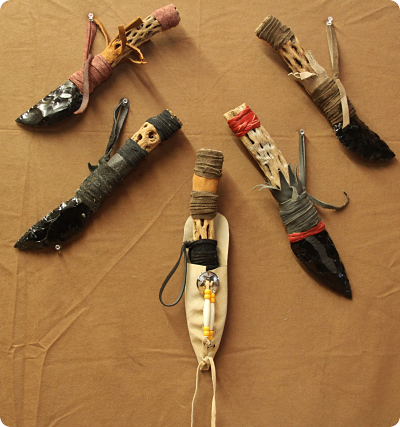 This native american indian knife and pouch is perfect for costumes, parades, boy scouts or collectors. Note: Leather strip color may vary from those shown, please contact us for any specific color request. Note: Price shown is only for one knife and pouch. Many are displayed in the picture in order to show a sample of the variety available. This is a hand crafted imitation (this product is not indian made) native american indian tomahawk. The tomahawk tip is made out of hand crafted obsidian. The tomahawk handle is made out of cardencha and is connected to the tip with leather strips. 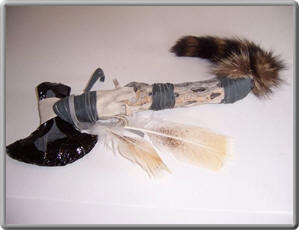 The tomahawk is adorned with a raccoon tail attached with leather strips and feathers. This native american indian tomahawk is perfect for costumes, parades, boy scouts or collectors. Note: Leather strip color may vary from those shown.